Quote Reply Topic: Ishy 2A1 rear handguard question. I have posted about my 2A1 project a few times before, but I just got a bulk of the parts from Sarco and Numric. Put the parts on and took it to the ranger for a basic function test. That went well, but I was only shooting at 20 yards. Need to find an outdoor range. Anyway, I noticed that the rear sight slider was sitting on the wood of the rear handguard when set at 200 meters. Since the rear sight protector blocks that area in photos it's kind of hard to see in internet photos. I'm wondering if I need to alter the wood to allow clearance for the sight leaf or if it was designed with that interference in mind. I would think not since the wood is not a stable surface to sit on. Could anyone here with an all original 2A1 tell me what I should do? Many thanks for the help. 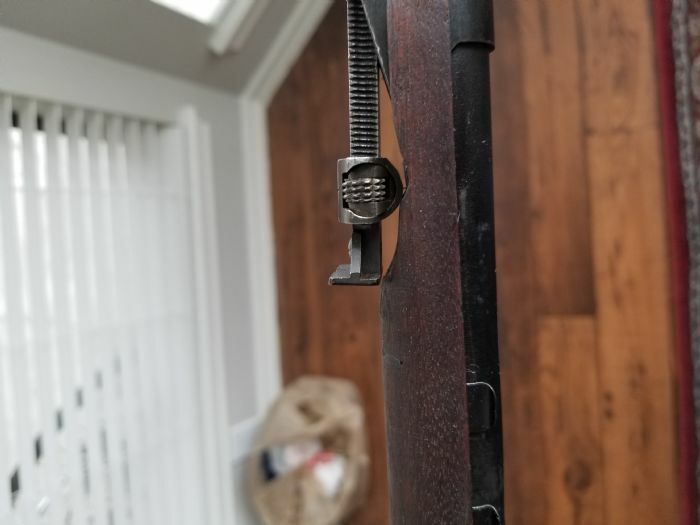 FYI the rear sight on the 2A and the 2A1 were different , the 2A had the rear sight of the no 1 mk 3* , that might make a difference , the 2A1 rear went out to 800 IIRC still had a 200 mark as the closest tho . You are correct about the 2A1 sight. I'll see if I can post a photo tomorrow to be able to illustrate my question. I've never handled a no1 mkIII enough to see how the sights sit. Only one I've ever picked up had a $1000 price tag, so I handed it back pretty quickly. The rear sight slider should fully engage the rear sight ramp at the lowest setting. 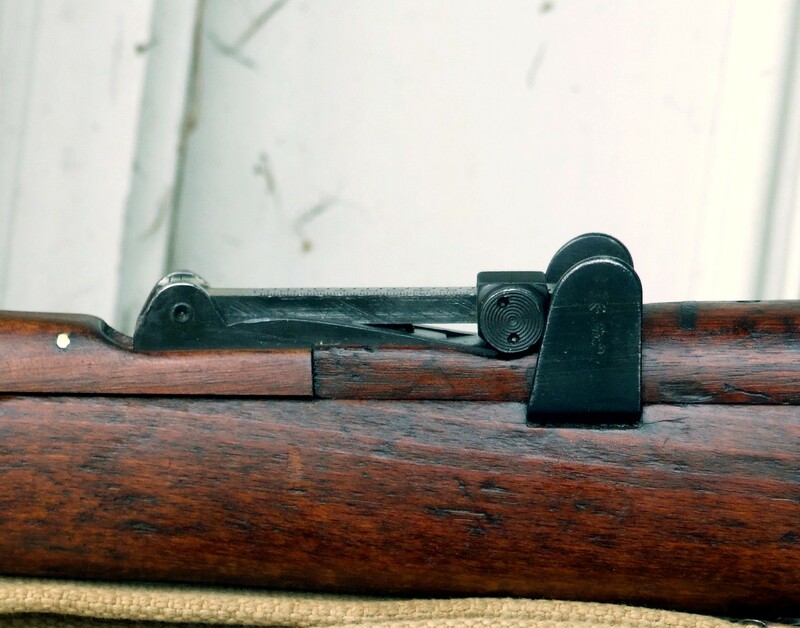 If the wood of the handguard is interfering and preventing the full contact then the wood will need to be sanded or filed a bit to remove the interference. My Ishapore clearly marked "2A1". 2.000 m / yds sight with finely adjustable rear sight blade. NO wood / slider contact, IMO. Good afternoon, gentlemen! I've had way too much caffine today. Below is a photo that will more clearly demonstrate my situation. You'll notice that the wood is fairly unfinished, so I'm going to be working on it next. You'll notice that the slider is sitting on the wood and not the ramp of the rear sight base. Also when I relieve that spot it looks like the notched part of the sight will be contacting next. 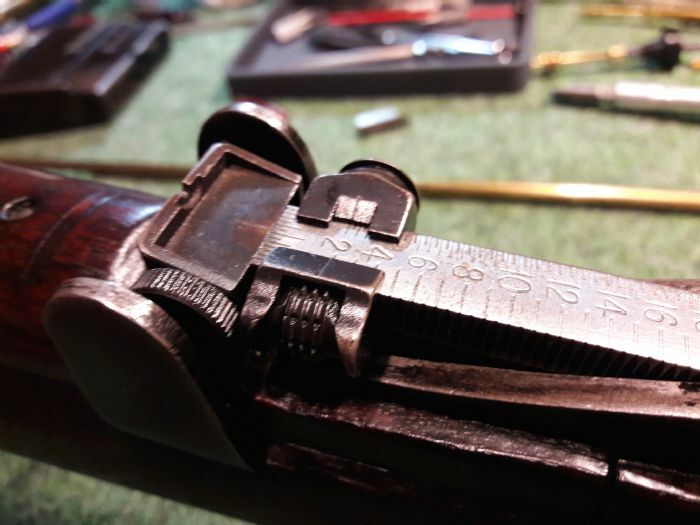 My BSA seems to have had the wood "scalloped" at the point where the rear sight body is. There is also considerably less wood at the rear where the ears transition onto the full coverage as well. Unfortunately the rear sight protectors hide that area. Rob, you need to relieve that wood so the rear sight does not contact it. The slider should sit fully on the rear sight ramp and the notched part should not have interference either. Needing to do this is not uncommon with NOS rear handguards. They were made oversized and had to be fitted to the rifle. The more I thought about it the more silly the question seemed. I wasn't going to talk about this in this thread, but A Square brought it up. 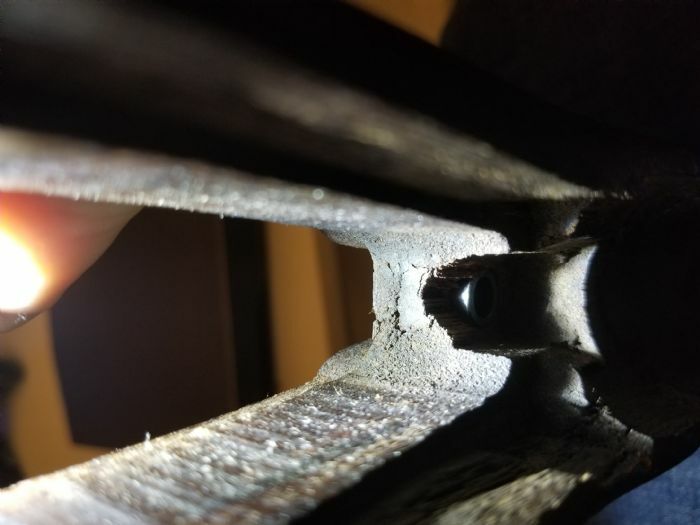 The wood behind the bushing for the mainscrew is cracked after only 20 rounds. What can I do to fix it and keep it from happening again? Or can I call Numric and get them to send me a different one, considering this one is also slightly warped and it was advertised as "very good" condition. That's a common weak spot. See if they'll replace it first, if not then you need to do a crosscut & "biscuit" wood insert to support it. Basically you make a slightly angled cut or two across the wood then fit a hardwood filler (Popsicle sticks are good for this) with the grain gong across the wood & glue it & & sand down to fit. If you look a pics of SMLE style rifles you'll see lots of them fitted. I really appreciate all of the help. I'm so glad to have found this wealth of knowledge.